Get his picks and write-ups for every game with Inside the Pressbox. 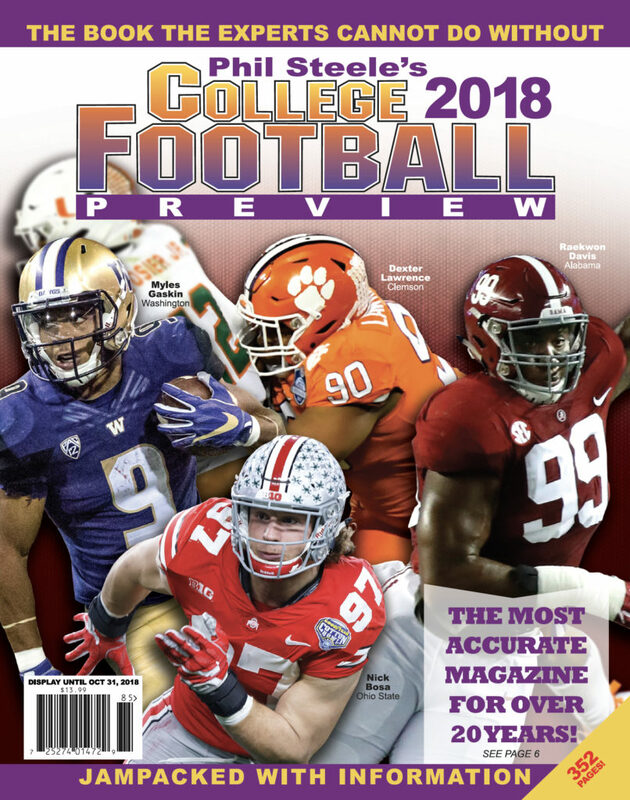 Phil Steele’s College Football Preview is the magazine that every sports show host and NCAA football fan waits for each year. Of course every other company will say they have the best, but put ours to the test! Go to the bookstore and hold them side by side. Look at their content and then look at ours! It’s easy to see that there is only one College Preview Magazine for you to buy! You get 352 FULL COLOR pages, including two pages on every FBS team. Most Accurate Preseason Magazine the last 20 years! Available now for 2018. Access via any Computer, Laptop, Phone or Tablet. Create your account for $12.99 to take the magazine wherever you go. Get the magazine delivered right to your door. Learn about our combo promotions. Orders are shipped within 24 hours. On newsstands now. Quantities are limited. Guarantee your copy by purchasing online or instantly.